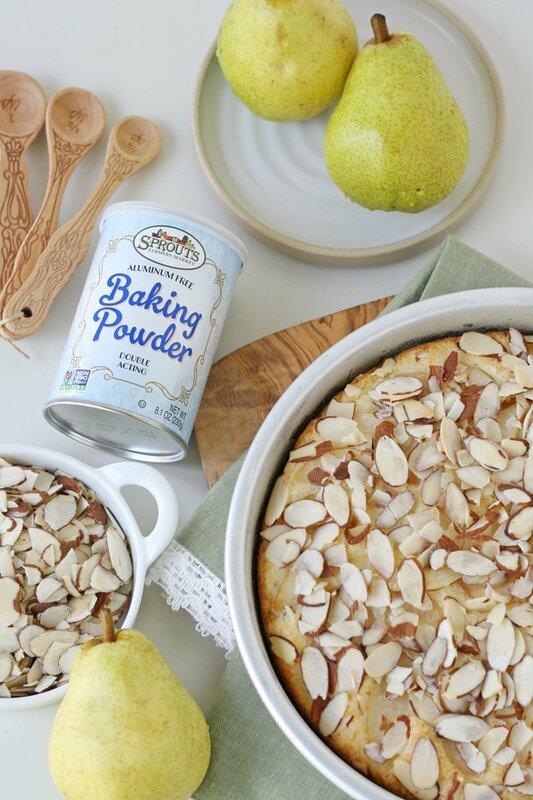 This delicious, one-layer Pear Almond Cake is just the perfect recipe to ease into fall baking! Yes, I said it… FALL! I know it’s still August and I do love summer… but there is something extra special about baking in the fall, and I’m ready to enjoy it! Even if you’re not quite ready to pull out all the pumpkin-spice recipes… this simple cake is a perfect way to enjoy fresh fall pears and some early fall baking. This post was created in partnership with Sprouts Farmer’s Market. My baking projects always start with a trip to Sprouts Farmers Market. I know I can find all my favorite baking staples like flour, baking powder, sugar and eggs… as well as fresh seasonal fruit like these pretty pears. And Sprouts bulk bins are the perfect spot to stock up on snacks for back-to-school, as well as baking essentials like nuts. Sliced almonds are such a beautiful way to add flavor and texture to so many desserts! 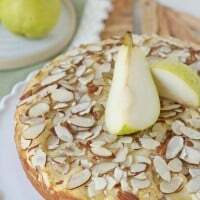 After you bake up this Pear Almond Cake, feel free to try my recipe for rich and buttery Almond Bars too! 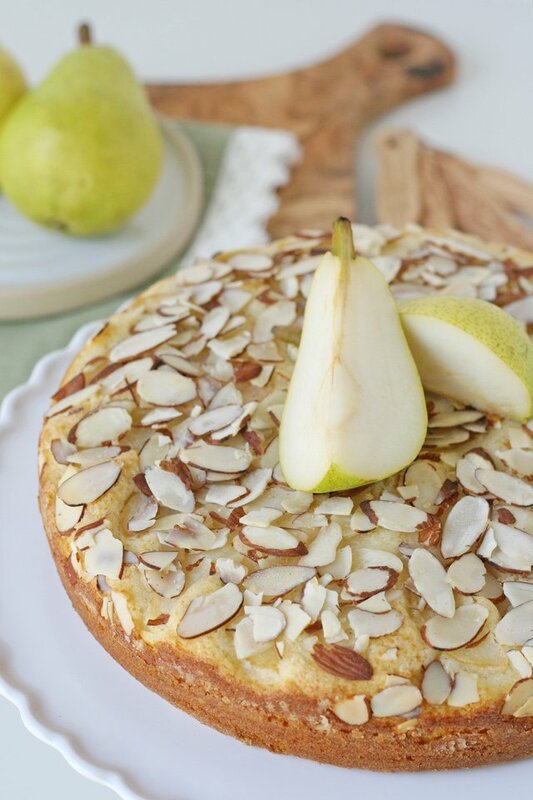 This Pear Almond Cake starts with a perfect vanilla-almond cake and then is baked with fresh pears and sliced almonds. 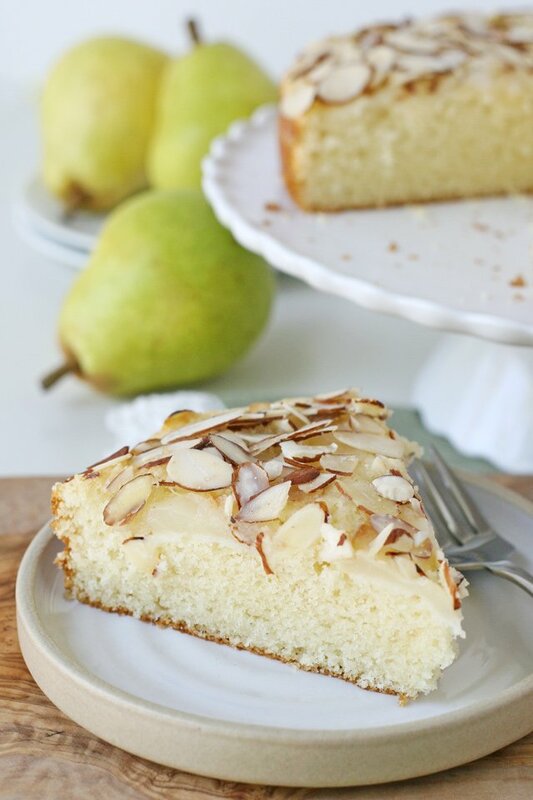 The pears add moisture and just a subtle flavor to the cake, and then the almonds add richness and texture. This simple and delicious cake is perfect with a cup of coffee or tea. This delicious one-layer cake is the perfect way to enjoy fresh fall pears! This cake is especially perfect with coffee, tea or milk. Prepare one 9” cake pan by lightly greasing the sides of the pan and then dusting with flour, then line the bottom of the pan with parchment paper. In a medium bowl, combine flour, baking powder and salt. Whisk, and then set aside. In the bowl of an electric mixer, beat butter until smooth. While mixing, slowly add sugar and continue to beat until the butter and sugar are well combined and the mixture is light and fluffy. Don't skimp on the mixing at this stage. While mixing, add the eggs one at a time, blending at least 10-20 seconds between each additional egg. Mixing well to incorporate some air is important in this step. Add vanilla and almond extract, and blend well to combine. Add sour cream and blend. While slowly mixing, add the flour mixture, blend a bit and then add milk. Blend just until all ingredients are combined. Scrape down the sides of the bowl as needed; stir by hand (just a couple times) to make sure all ingredients are well blended. Pour the batter into the prepared pan and spread to level. Peel 1 large or 2 small pears. Remove the core and slice into thin (about ¼” thick) slices. Lay slices on top of the cake batter, covering the entire surface with a single layer of pears. On top of the sliced pears, sprinkle sliced almonds and then sprinkle about 1 tablespoon course sugar on top. Bake in prepared oven for 35-40 minutes, or until a toothpick inserted in the center comes out clean. Cool cake in the pan for 5-10 minutes, then gently loosen from the edges of the pan and remove from the pan. Enjoy immediately, or after cooled. The cake is best served the day it’s baked, or store the uneaten portion in a sealed container in the fridge. Any cake kept in the fridge is best brought back to room temperature (allow to sit out for 30 minutes or so).